A mother monkey's milk sends signals to nursing infants that may program the infant’s behavior and temperament, according scientists at UC Davis and the Smithsonian Institution. Infant monkeys whose mothers had higher levels of milk energy soon after their birth coped more effectively and showed greater confidence compared to those whose mothers had lower milk energy, the scientists report in the February issue of the American Journal of Primatology. “This is the first study for any mammal that presents evidence that natural variation in available milk energy from the mother is associated with later variation in infant behavior and temperament,” said Katie Hinde, an anthropologist at the California National Primate Research Center and the nutrition laboratory at the Smithsonian’s National Zoo. Hinde is co-author of the paper with UC Davis psychology professor John Capitanio. 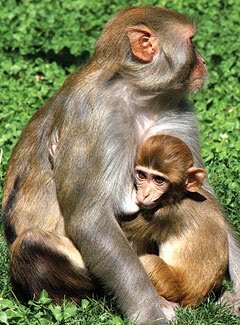 Among rhesus macaque monkeys, mothers who weigh more and have had previous pregnancies produce more and better breast milk for their babies than mothers who weigh less and are less experienced. Researchers used large groups of rhesus macaques living in an outdoor enclosure at the California National Primate Research Center at UC Davis to study how this natural variation in breast milk quality and quantity sends a signal to infants about their environment. The researchers collected milk at two different times from 59 mothers: once when their infants were one month old and again when the infants were three and half months old. They recorded the quantity of milk produced by each mother and analyzed the energy value of each animal's milk sugars, proteins and fat. These figures were combined to calculate the available milk energy generated by each mother. Although all of the monkeys in the study were fed the same diet, milk from mothers who weighed more and had had previous pregnancies contained higher available energy when their infants were one month old than the milk of lighter, less experienced mothers. "Our results suggest that the milk energy available soon after birth may be a nutritional cue that calibrates the infant’s behavior to environmental or maternal conditions," Hinde said. At three to four months old, each infant was assessed for behavior and temperament. Infants whose mothers had higher levels of milk energy soon after their birth coped more effectively (moved around more, explored more, ate and drank) and showed greater confidence (were more playful, curious and active). Infants whose mothers had lower milk energy had lower activity levels and were less confident when temporarily separated from their mother.